Keeping little hands busy can often be a struggle. And while I usually don’t have a problem with a messy activity, sometimes you just want something simple to throw at them without the worry of cleanup coming later. You need to make yourself a couple of these button practice felt flowers! They are perfect for around the house, car rides, plane rides, waiting rooms, restaurants, you name it! This fine motor activity is perfect for hand-eye coordination and lets face it… teaching them to button and unbutton is pretty important too. We created no sew button snakes a while back if your little one isn’t a flower lover. My daughter loves to create flower crafts, so I wanted this project to be something that she loved making and working with. She can sit and create flowers for long chunks of time so that’s a win in my book! A button. Size doesn’t matter too much. A larger button is easier for a younger child to manipulate. Felt. Green and any color for flowers. Hot glue and hot glue gun. Start by taking your pipe cleaner and threading it through your button. Twist off to attach. Using hot glue attach the pipe cleaner under the rim of the jar lid. Then bend and glue so that the button comes away from the center of the jar lid. Next, make petals and leaves. Cut the felt into different sized squares. Fold into quarters and cut into a petal or leaf shape. Play around with different sizes and shapes to give them a lot of variety! Then cut a slit in the middle of each shape. You want it to be about the size of the button. Felt will stretch a bit. The older the child the snugger you want it to be. This way they have to actually button on the flower petals and leaves! They look so pretty! You could even add a magnet on the back to keep them on your fridge! 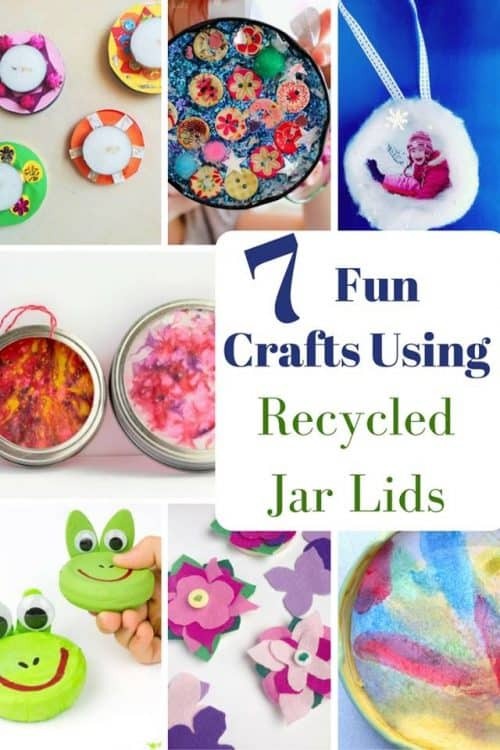 We like to hold onto random things to craft with… jar lids happen to be one of them! This is perfect for my 4-year-old. Check out more inspiration for your 4-year-old here.